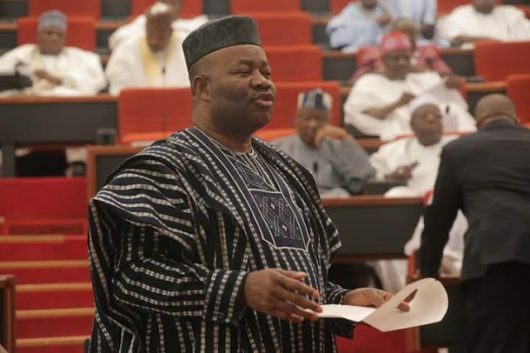 A Federal High Court sitting in Abuja, has been approached to declare the seat of Senator Godswill Akpabio at the Senate vacate and order the Independent National Electoral Commission (INEC) to conduct a bye- election within 90 days into the vacant seat. The matter was instituted by Tolu Babalaye on behalf of the Incorporated Trustees of Dynamic patriotic Citizens Foundation. Our correspondent reports that the Senate; the Senate President; the Deputy Senate President; the Clerk of the National Assembly; Senator Godswill Akpabio and the Independent National Electoral Commission were mentioned as defendants in the suit. In the suit number FHC/ABJ/CS/887/2017, is further asking the court to declare that Senator Akpabio has lost his seat as a Senator of the Federal Republic of Nigeria, by virtue of his defection from the Peoples Democratic Party (PDP) to All Progressives Congress (APC) on August 8, 2018. The Plaintiff in its argument submitted that the former Minority Leader defected from the PDP to the APC, without any division, crisis or faction in the PDP as envisaged by the proviso to section 68(1) (g) of the 1999 constitution. The suit wants the court to determine “Whether or not by virtue of the provisions of section 68(1) (g) of Nigerian Constitution (as altered), and in view of the decision of the Supreme Court in the case law of Hon. Ifedayo Sunday Abegunde V Ondo State House of Assembly and 12 others (2015) LPELR -24588, which sufficiently interpreted the said section 68(1) (g), Akpabio who defected from the PDP to the APC, on August 8, 2018, without any division, crisis or faction in the PDP as envisaged by the proviso to section 68(1) (g) of the 1999 constitution and interpreted in Hon. Ifedayo Abegunde’s case, has not lost his seat as a Senator of the Federal Republic of Nigeria and therefore liable to be kicked out by the Nigerian Senate. The suit was supported by a 12 paragraph affidavit deposed by Akinola Apanisile. In the affidavit, the group averred that Akpabio, being a legal practitioner is aware of the consequences of his defection and also the fact that he ought not decamped from the party that sponsored him into the Senate. Meantime, no judge or date has been fixed for the hearing of the matter.